Wow, I just received my latest Stitch Fix. It was pretty amazing. 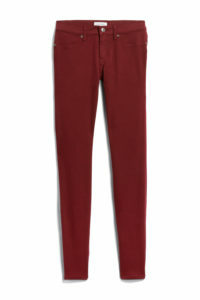 Of course, I love the Lila Ryan Louise Skinny Jeans (photo credit – Stitchfix.com), this is my third pair. They are stretchy skinny jeans that fit great. Now I could make some jeans, but why bother. I sew because I like clothes that fit, and these fit perfectly. I can fold the cuff or wear them with a break. I have a white pair, a denim pair and now an autumnal burgundy pair. 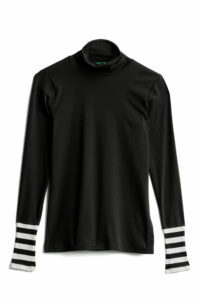 The black Ralph Lauren Thelima Fitted Turtleneck Knit Top (photo credit – Stitchfix.com) is so cute and current with the striped cuff. It is clean and simple while being stylish. 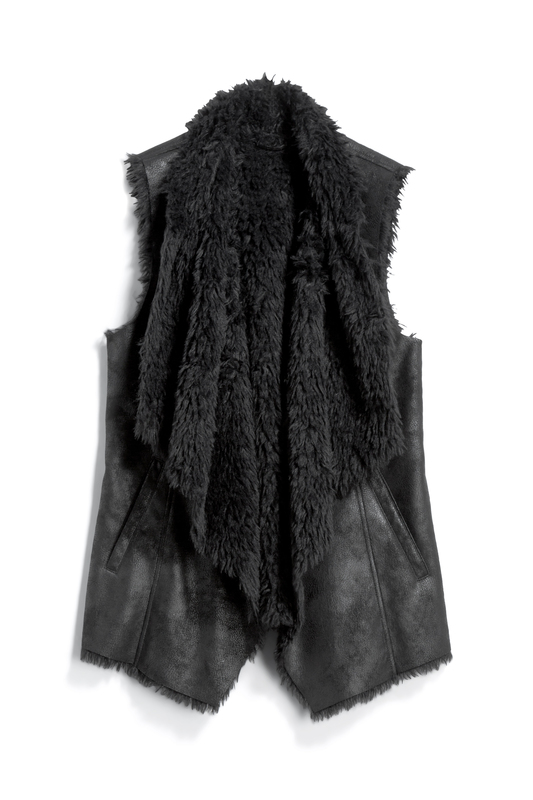 The black faux leather and Shearling MO-KA Linz Faux Shearling Vest (photo credit stitchfix.com) is just plain fun. I love a great vest because they give you a smooth line, keep you warm yet your arms are free from the bulk of a jacket. The black fur is cozy and soft. 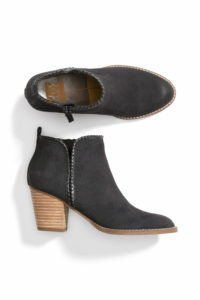 The black suede DV8 Junie Woven Trim Bootie (photo credit – Stitchfix.com) round out the outfit and are the quintessential fall accessory. Everyone needs a pair or three! 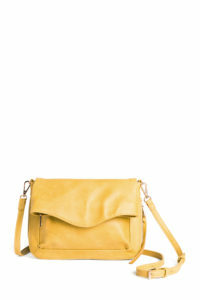 I finished the look off with a chartreuse run-a-round bag MODA LUXE Ela Fold Over Crossbody (photo credit – stitchfix.com) from my June Stitch Fix. I wear it with everything. The longer I work with my stylist, the better team we make. Besides, it’s so much fun to find a box of cute clothes waiting for you when you get home! Check out Stitch Fix Here! Next: Next post: Whole 30 – Day 1 – Ready, Set, Go! I just heard a commercial for Stitch Fix this morning! If I were working and didn’t wear thrift store clothes, I would definitely do something like this. What a great service. Nice post too! That’s great that they got it right for you style! I really like those jeans and sweater! Great style! I will check them out. I love your sense of style! Looks like you definitely have a wonderful partner in crime at Stitchfix! I have not heard of Stich Fix before! Looks like they did a great job of getting your style! I am going to check them out! Thank you! You should, you have lots of opportunity for input. Such a cute outfit! Love this. Stitch Fix is such a great company. They have really cute clothes. I have done Stitch Fix, Wantable and Trunk Club. Wantable is my favorite. It is fun to get these subscriptions in the mail. You got some great picks! I love that black vest, it’s super cute. I was with Stitch Fix for a couple of months and they have beautiful clothes. Most of the clothes are lovely. I always get compliments when I wear the black vest. 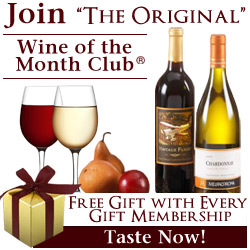 I really love the idea of this subscription box. I received a couple of fixes and liked the clothes too. Oh I’ve heard of them! Very cool!! I have several friends who use StichFix and they just love it. I want to try…. haven’t only because of time. No other reason. This is another prompt. Thanks! I love getting a new box of clothes – so much fun – give it try! I’ve heard about Stitch fix a few times now. I really gotta check them out thanks! I usually have pretty good luck with the stylist I have now. I had to give it a few tries to get it right. I love the idea behind it. I hardly ever buy clothes for myself because I’m so cheap, but if I did I would probably use something like this because I HATE shopping. So Funny! I love shopping, I just have a clothes addiction!! I’m glad you got things you loved! I used Stitchfix in the past but fell out of love when I kept getting different stylists. But I hear some people still really love it! That’s too bad. I have had a few I’ve had to send back, but I make sure I update my preferences pretty frequently. I’ve been so tempted to try this, but I haven’t had the courage! You got some really cute pieces! Do it! If you don’t like them, you can send them back. I never used Stitch Fix before. I’ll have to try it once my son is out of his toddler years. I need clothes I don’t feel bad about getting messy. I hear that, I feel that way with my granddaughter! I have wanted to try this for a while! I love these outfits! Tricia, you should give it a go! I would wear pretty much everything in that box. I haven’t seriously considered giving Stitch Fix a try, but you just might tempt me. I’ve always been curious about stitch fix. Looks like they’ve nailed it for you! I’ll have to give them a try. I LOVE Stitch Fix! So much now my son wants to do it too! Maybe – he does love his clothes! I know a guy that subscribes, he’s really tall and loves the stuff they send him!